Because we have our own roasters, we roast every day so your coffee is freshly roasted on the day of shipment every time. When buying gourmet coffee this is an important point to insist on. We offer shipping via US Postal Service Priority Mail or FedEx. 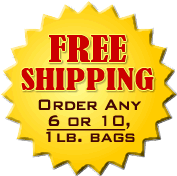 Shipping fees are calculated at the time of your order, please see the rate calculator during checkout. Yes, depending on the shipping country we can ship internationally. Please contact us for shipping rates. In order to receive the additional discounts in price, a minimum three (3) shipment subscription is required. After the initial three shipment period the subscription may be cancelled at any time. To cancel or change your subscription, simply email us or log into Your Account. Shipment: The first shipment will be sent at the time of order and then at intervals of either 2 weeks, one month, or three months thereafter. If you would like a different shipping schedule or method just email us as we will ship to your instructions and schedule. Payment: You are only charged when we ship for what we ship. We do not require any prepayment for your subscription. If you would like to pay in some other way, just email us and we will contact you to arrange your order and alternate payment method. Don’t see a delivery program you like? Simply email us with what you would like and we will tailor a delivery schedule, product type, roast temperature, and quantity to meet your needs.